Did the Flood cover the whole earth? Most students of the Bible thought the Flood was a global one until about 250 years ago when major problems were discovered. There’s not enough water on earth to cover Everest, Kilimanjaro, or McKinley. Some people said a wooden boat the size of the ark would spring hundreds of leaks and sink. Others said the ark was not large enough to house two of every of tens of thousands species for a year. And those who argue for a local flood say there’s no discernible evidence for a flood covering the entire planet. Global flood advocates have answers to these “problems,” but to some extent, it’s a matter of seeing what you want to see, whichever side you are on. Whether the Flood covered the whole earth is a key issue in the different ways “Flood geologists,” who believe the earth is about six thousand years old, and mainstream geologists, who believe the earth is about 4.5 billion years old, explain the formation of the earth as we now know it. Find out more at The Extent of the Flood. Did the Flood cover the whole earth? Here are two views: Noah’s Flood told the story of the Mediterranean’s flooding the Black Sea, and Noah’s Flood actually covered the entire earth. Noah: The Real Story also contains a third view—Noah’s Flood told the story of a freak event on the Euphrates River in ancient Sumeria. 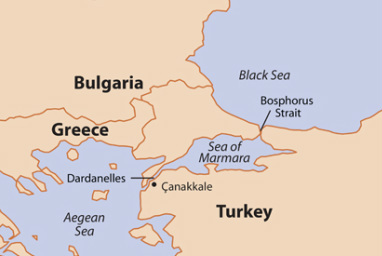 The Black Sea, north of Turkey and south of Russia and Ukraine, is five times the size of Lake Superior, America’s largest lake, and connected to the Aegean Sea by the Bosphorus Strait, the Sea of Marmara, and the Dardanelles. According to two scientists, one thousand years of especially arid conditions 7,500 years ago caused the level of the Black Sea to plummet, cutting it off from the Aegean and Mediterranean Seas by a high piece of land where the Bosphorus Strait is today. The river-fed fresh water of the Black Sea made its shoreline especially fertile, which enabled people to develop an early farming culture. When the last Ice Age ended, water released from vast ice sheets returned to the ocean, causing sea levels to rise. In about 5600 BC, salt water began to spill into the Black Sea through the Bosphorus Strait, eventually at a rate two hundred times the flow over Niagara Falls. The Black Sea rose a foot a day, submerging in some places about a half mile of land. The flooding lasted for at least one hundred days until sixty thousand square miles were inundated. Those living around the Black Sea fled for their lives. In 1999, marine geologists William Ryan and Walter Pitman explained their proposed history of the flooding of the Black Sea in their best-selling book, Noah’s Flood: The New Scientific Discoveries about the Event that Changed History. They speculated that farmers fled to Europe where they took their farming skills. They also asked if this flood inspired the stories later told in the Babylonian Gilgamesh Epic and the biblical story of Noah. But the story of the Black Sea flood doesn’t end there. Robert Ballard, who discovered the Titanic, was fascinated with the story Ryan and Pitman told and decided to look for evidence. Using advanced robotic technology, he says he found an ancient shoreline submerged four hundred feet under the current surface of the Black Sea. He started mapping it and found tools, ceramics, freshwater mollusk remains, evidence of houses, and “one very large shipwreck. ... I’m convinced that we will find evidence of a civilization from the time of Noah at the bottom of the Black Sea," he said. Ballard gave an interview to ABC News that was aired in December, 2012 describing his findings. He said he was planning to return to the Black Sea in the summer of 2013, but I have not been able to find any information of such a return. Ballard's office did not respond to repeated inquiries. Dr. John Morris, president of the Institute for Creation Research, explains that uniformitarianism, the assumption that the processes operating in the world now always operated in the same way, dominates education today, especially those sciences dealing with the past. There’s a certain comfort in this because it allows conclusions to be derived from observations. But if the assumption of uniformity of processes is wrong, the conclusions will be wrong. A more realistic approach, he says, is catastrophism, the assumption that the earth was formed by sudden violent events. Uniformitarianism requires extremely long periods of time to explain the changes we see in the earth. Catastrophism allows for more rapid changes in the earth. At the time of the Flood, there was most likely one supercontinent, sometimes called Pangaea. It was relatively flat and surrounded by a single global ocean. When God decided to destroy humans and animals, a supernatural, cataclysmic, and global series of events occurred that caused the Flood. First, “All the fountains of the great deep burst forth”—perhaps underwater volcanoes all erupting at the same time, sending huge volumes of sub-surface fluids onto the land. Second, “The windows of the heavens were opened”—we don’t know what this was, but it was different from normal rain and undoubtedly more intense. Water from all these sources covered Pangea entirely, and Pangea began to break apart. What is usually called “continental drift” was more like a “continental sprint” as the continents moved into the positions we know today. The Himalayan Mountains were formed when India slammed into Asia. The Rocky Mountains were formed when two plates came together. The time of the Flood was a violent one. Continents rose and spread apart as ocean basins sank, giving rise to immense fractures in the earth’s crust. Shock waves reverberated throughout the ocean, bringing unimaginable devastation to sea life. Waves of water and loose sediments carrying sea creatures were pushed inland. Storms dozens of times greater than present hurricanes buffeted the earth. After months of turmoil, the waters drained into newly deepened and widened ocean basins, exposing dry land. The tectonic movement of continents facilitated the water draining into the oceans. Gradually, the land became dry and the water table lowered. Was the Flood a worldwide flood or a local flood? The Bible indicates it was global in extent and dynamic in nature, says John Morris. David R. Montgomery, The Rocks Don’t Lie, (New York: W.W. Norton & Company, 2012), 11.